My sister Clare and I treated my brother David badly. He had everything going for him: cute red curls, mechanical toys, some surprising signs of physical agility, and extreme youth. But, being six, he was hopeless at board games, and hopeless at relations, too. He didn't know an aunt from an uncle, or a cousin from a cuddly kangaroo. If he wasn't winning, he tipped the board over, and seized a blunt instrument with which to attack us. So we had a ruthlessly unspoken council of war, and cut him out of the games altogether. There were plenty to cut him out of: Totopoly, Monopoly, Buccaneer, Whot, Escalado, Contraband, Tri-Tactics, Risk, Cluedo, Lotto, Ludo, Scoop, Sorry and an infinite number of card games. Clare and I played these like children obsessed, whilst he skulked nearby, waiting for a bit-part in whatever fantasy we had cooked up for him. He was allowed the status of a junior teddy bear. He was the patient on the trolley in the corridor in Doctor And Nurse. He had the worst seat in front of the television. He also had a temper like Genghis Khan on the F-Plan. On one celebrated - perhaps not by my brother, it's true - occasion, Clare and I played with a game called Go for seven days. We are not talking abstract Chinese head-sport here. Go - full name, Travel Go - was a game about foreign currency transactions - obviously all the rage in those heady days of about 1962 - and involved some complex mathematical calculations involving exchange rates and bureaux de change . I did say, playing with Go. What we were in fact doing was playing Monopoly, a game that had been transformed by the curious chance that we lived next door to a millionaire who had struck it big on a stock market winner called Poseidon. Money had transformed our neighbour's life. It had transfixed it, in fact. But more to the point, it had altered the rules of Monopoly in his household, and therefore ours, since his children taught us the rules. The new version of Monopoly was very simple. You started with more money ( only £1500 , don't be daft!). You picked up more money for landing on Free Parking, on Go, or (best of all) throwing a double-one (“pin's eyes”). Mr. Waddington and his chums had foreseen the problems of excess cash in the system. As any economist will tell you, it makes the rich richer, and the very rich very much richer indeed. And as there were only two of us - get out of the room, David - we soon exhausted the meagre supplies in the bank. Mayfair with four hotels on it? Ha! So what? (Yes, we'd adjusted the property rules, too). This was an era of boom and boom. So much so, in fact, that we had had to resort to pillaging the foreign currency from Go. On and on we went, stockpiling our assets, building houses on stations, getting out of jail with Hong Kong dollars and roubles. After the second day, the chance of either of us being driven to bankruptcy was as remote as finding the abominable snowman eating bacon sandwiches on the summit of Mount Everest (26,002 feet). The crash came on the sixth day, when the dog, obviously training to be a television personality, whipped the tablecloth away. Well, they said it was the dog. David had an alibi. This happened on our annual family holiday, an event that always took place in early September, in a rented house at the end of a terrace in Bamburgh, about seventy miles up the Northumberland coast. Through one window of the bedroom we shared, you could see the beam of the lighthouse winnowing the dark. By day, you could see the gigantic Norman fortress of the castle (it appears in Monty Python And The Holy Grail , and also in El Cid and in Polanski's Macbeth - indeed, Bamburgh's beach, where I dug holes, is where the witches ceremonially place a severed hand and other goodies under the opening credits of the Polanski film). The house itself was a curious let - the owner, a Miss Mather, had obviously had some anxieties about releasing the property. Much of the kitchen equipment, and nearly everything on the mantelpiece had a label tied to it, with messages like DO NOT TOUCH or THIS MUST NOT BE USED FOR COOKING). But it was the bedroom that really interested us, because of the flashing light. And because of the owl. The owl was a small, carved wooden ornament, about three to four inches high, and it held a special significance. It was a totem you wanted by your bed. It helped to make the holiday happen. It was an object of devotion. It followed that, as the eldest, I planned some days in advance what my strategy would be, since I wanted what I almost always got - the bed with the lighthouse, and the owl by the bed. Since Clare had the same aim, and of course, this meant that David did, too, it required some heroic bargaining skills. The key that unlocked the problem was the camp bed. The camp-bed could be said to have had a similarly totemic charm. A wonky green canvas put-you-up, inclined to collapse, and very uncomfortable, it was, in its proper place (at home) something of a treat. So the first piece of psychological warfare to be waged was with David. I told him I wanted the camp-bed. Tempted by the prospect of the lighthouse bed, he saw at once that the object of my desire could be thwarted with ease. He wanted the camp-bed. In a big-brotherly way (a headlock? ), I expatiated on the merits of this canvas good-for-nothing, and upon my inalienable right to it as the senior child. After an appropriate period of argument, I surrendered. He had the camp-bed - and the no-less desirable sleeping-bag - and victory was his. This, of course, put him right out of the running for the owl and the lighthouse. Now I had the trickier task of dealing with Clare, a much more formidable opponent, because she claimed to remember what had happened the previous year. My main tactic was to extol the virtue of the non-lighthouse bed over the camp-bed, which it was her turn to sleep in, and to suggest that it would be David's turn to sleep in the lighthouse bed if we weren't careful. I reminded her that she had had the owl, or the lighthouse, the previous year (a lie). Into this, the feelings of the owl had to be taken into consideration. After all it lived near the lighthouse bed, it might be unhappy, it would have a trauma (not that my pyschobabble was up to this level at that age). And besides which, if she had the owl, I wanted her pyjama case (in the shape of a poodle) if she was going to have the owl, and I didn't mind if she had one or two nights in the lighthouse bed, but not the first night. Watching that light, and counting the seconds between the flashes, the owl hibernating peacefully nearby, I do not exactly remember thinking all's right with the world . But it was. The Cuba crisis and the shootings on the Berlin Wall did not impinge. My father had bought a cine-camera, and his films seem to show, in its pasty colours and its curious sunlight, what innocence and tranquility are made of. Here is my brother, in a Don't Look Now red coat, scooting down the hill at Lindisfarne. Here is my sister, wearing glasses to correct a lazy eye, pushing her arm around my mother. Here am I, skipping my legs up and down, in khaki shorts, pushing my tongue out and grinning. Now we are edited into the tide. We run in and out of the corrugated water, kicking spray. My mother is stretched out like Ava Gardner in front of a candy-striped windbreak. Clare is wearing an inflatable ring around her waist in the shape of a duck. She has to have a petalled bathing-cap, because she is a girl. Now my brother rubs his eyes, sobs, marches. The dog nibbles at the sea-grass in a desultory way. The family moves soundlessly and full of jubilation through the lens of my father's eye. I buried my brother just to the right of the garage, which housed my father's very fast car. He was addicted to speed (the first book I remember reading was Speed Was My Life by Alfred Neubauer, the team manager of Mercedes. My father only ever read sports books, or James Bond novels), and had an E-type Jaguar, one of the first. I hated it, because of the odour of fresh leather, and my allergic reaction to movement of any sort. I wasn't born to move about too much. I was a bookworm instead, and burrowed my way through all ten volumes of Newnes Pictorial Encyclopedia , on which my world-view is still probably very dependent. Once I had bored my way through this pile of knowledge, I bored my way through everyone who came into contact with me, too. Facts and more facts. I was able to recite them like a parakeet on a power-surge. My brother's grave was not peculiarly elaborate. The soil was moist, and the spade I used, although it was too big for me, did the job easily. It was shallow enough to rest a length of corrugated iron over a four-year-old, and easy enough to disguise the iron with further spadefuls of earth, until there was a satisfying mound, at the end of which I planted a rough cross, with a plastic helmet resting on it at an angle. To be fair, my brother had not objected to being buried. After all, I had supplied him with a) a flashlight, b) a comic, and c) a length of hose from his underground resting-place to the open air above. I thought my mother would be impressed with my handiwork, and did some shouting at her through the kitchen window. After some persuasion, she came to see what I had been up to. It was probably out of some misplaced relief that I wasn't buried in a book. She inspected the graveyard, and nodded some bewildered approbation. At this point my brother piped up with “Hello Mummy!” She seemed quite indignant at my initial reluctance to dig him up. But that's mothers for you. All they think of is children, children, children. His next remark was a facer. “Would you like to know your chassis number?” he asked. There are many multiple-digit figures in life, and this must count, at least to me, as somewhere towards to the bottom of the Uninteresting ones. Resisting the temptation - or perhaps I didn't resist, I was quite young at the time - to ask whether he had Eamonn Andrews and the This Is Your Life team in his patrol-car, I waited patiently while he fetched it. He was showing off: it was the dawn of the computer age, and he had just acquired the facility to look me up. If he could have reached in and patted me kindly on the head, I suspect he would have done. What is the mystery behind the Talbot sports two-seater car found wrecked and abandoned on the Great North Road, near Walshford Bridge, five miles from Wetherby? Though the police are conducting a thorough search, no trace of a driver or occupant has been found. When discovered by a passing motorist in the early hours of the morning, the car was found on the grass verge at the side of the road, wedged against a stone wall. The radiator was torn off, and the lamps, windscreen and steering wheel were a ruin. Despite wreckage, which indicates a terrible impact, there are no bloodstains to be found, and inquiries at local hospitals have all drawn blank. The only clue is a broken dental plate discovered in the back of the car. The registration mark is GR1 (Sunderland) and the licence disc also bears a Sunderland stamp. It looks as if my grandfather had been, as ever, in a great hurry. However, even though the police did not have dial-up access to a national database in 1933, it is still rather mysterious as to why it should be much of a mystery. It looks like the Colonel had done a runner, and it is wicked supposition to think that gin might have had something to do with it. At any rate, he loved fast cars, although, rather eccentrically, he wore a hair-net for an open-top ride: he was a bit of a fop on the side. My great-grandfather - who was apparently an “excruciating driver who loved powerful cars” - also had an incident on the road, it transpires. His denial of any responsibility is a masterly admission of guilt. What survives is his letter of August 20th 1920 to a Mr. John Hughes of Shotton Colliery, who has levelled an accusation at the sole proprietor of the prosperous Sunderland shipyard. Your letter of yesterday was the first I knew of my accident on August 14th - it is quite true I was passing through Easington Village at the time you mention, also I remember a Motor Cycle and Sidecar barging round the sharp turn in the middle of the Village, I also remember thinking at the time that had I not been especially careful approaching this corner and sounding my Claxton Horn (sic) the Cyclist would have been into my Radiator, however you observed me and went on (to say I knocked you onto the kerb is totally untrue) if you did hit the kerb I suggest you took the corner too fast and more over to my side of the road than you should have been, having to swing back to your side of the road or the corner, you lost control of the Machine, but this must have happened after I got round the corner, as I did not know anything had happened to you otherwise I most certainly should have stopped. My great-grandfather's letter is a little heedless of the road as it starts. Then, as the sentence builds up speed, it starts to hit the kerb with worrying frequency, swerves, and eventually piles into the full stop with all the gusto of absolute culpability. It comes as no surprise to learn that he also crashed a pale blue Langonda in his sixties. My father never mentioned his parents to me. But he did frequently mention his grandfather, and it is plain that his grandchildren idolised him. Whatever his problems with road-holding, he plainly had some nous about him when it came to business. At first he worked with his ship-owning father. 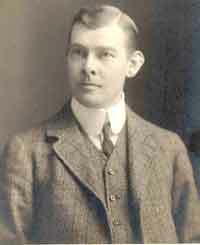 After joining J.L.Thompson's, the major shipbuilding concern in Sunderland, he took charge of their ship-repairing sideline, which for Thompson's was of very secondary importance. In founding the ship-repair yard in Sunderland, he looks to have spotted a major gap in the market. In no time at all, he had built up a considerable workforce, and by the time of the First World War, he had a thriving business. Wartime probably made his yard; certainly he was well placed to build up his business. He appears to have been sent round the world as a young man (although this may be a story, there are no records of the said travelling), and to have returned as full of glee as he had departed. But he poured all this energy into sporting rather than social occasions. He was a brilliant ice-skater, an oarsman who won trophy after trophy, a great fisherman, and a crack shot, too (the Daily Mail reported his feat on his seventieth birthday of shooting twelve birds with twelve successive shots). The same week, on New Year's Day, he said to my grandfather, “George, I'm just about buggered.” The old cowpoke of the imagination did not last much more than a fortnight. My father also used to say “Ooo-sha”, as an extravagant accompaniment to a pleasing sneeze. It was not until six years after his death that I realised this had been a family routine he'd been perpetuating. He was in some ways as enigmatic a man as his grandfather had been - another loner. Immensely social, but a loner at heart. He had opted for the navy at 13 because it appealed to his abiding sense of order. The naval routines never deserted him. He wouldn't use shampoo; only soap on his hair. Each evening, he emptied his pockets for all the world as if he were preparing for the angel Azrael in the night. He lined up the coins in order of denomination in perfectly-lined towers. He drank gin and tepid water, half-in-half, no ice or lemon. He also kept every single cheque-stub. Had he wanted, he could have run a tax-man back through the ins and outs of his bank account for forty years, in date order. But to a child, his most miraculous feat in this respect was to preserve two objects regularly pilfered by small and careless mitts from the drawer where they belonged: a pair of nail scissors, and a set of poker dice. He must have had in-built sonar to have recovered the scissors so often. Children like chopping up paper, and there was a reliable source of something not too sharp. My grandfather and his sister Nancy, Willie's Greenwell, in the 1890s. He went on to found two children. Nancy's daughter, Rosemary what was at one time the most successful ship Bowmer, accidentally instigated this search. repair yard in the world. Nancy's son Bill was killed in World War II. A family argument meant that I never met Nancy, although she died in 1989 at the age of 92. It was my sister who inherited this gene. It dropped entirely out of my own DNA sequence, not least because I very early on decided that pieces of paper were not inanimate objects. It was a source of weird faith with me that they would rather not be thrown away, however scrumpled and dissolute they had become. My desk at school was crammed to bursting with rags and scraps of old exercise-book that had begged me to keep them on as mates. So were my pockets. This did not play well with one of my teachers in particular, who happened to be the deputy head, as well as the headmaster's son-in-law. During a Maths lesson, something in him snapped like a cheap protractor. He advanced on my desk, and flung it open. Then he threw everything inside across the room, in every direction, raging and snarling. I was obliged to crawl around the room, retrieving (and, oh God, binning) every single stray object I had been cherishing. The indignity was insignificant. The disloyalty to my now disposable friends was much harder to take. This was not my only run-in with him. The school to which I had been despatched between the ages of 8 and 13, which was in North Yorkshire, valued academic achievement in a rather surprising way. It based its prefect system on it. If you did well in end-of-term exams, you were moved up to the next class. This process continued until you met your match. The top form, rather laughably called “the sixth form”, were prefects as of right. This meant that swotty types like myself could be given posts of responsibility whilst older boys were still struggling further down the ladder. I reached the sixth form with seven terms to spare. There was only one post you could give someone who had swallowed Newnes and Britannica and Arthur Mee's Children's Encyclopaedia whole, and who was disturbingly interested in a recherché book called The Waterloo Roll-Call . This listed all the officers who had taken part in the Battle of Waterloo, and whether or not they had been casualties. That was it. A list. The deputy head called me aside and told me I had a docketing - is there such a word? - brain. I was to be the library prefect. The duties of the library prefect were not prescribed, as far as I can recall. Perhaps they were dogsbody jobs like tidying away the National Geographics. However, I decided on a much more adventurous approach. This was after all my first Appointment, and I was determined to make the most of it. It must have been a school that set aside acres of time, or perhaps it was my alarmingly un-sporty nature, which meant that I stayed inside whilst everyone else basked in the mud or sprinted in the sunshine. At any rate, I conceived a plan, and had the leisure to put it into action. Not many of the boys were reading, it seemed, apart from me. I had done Captain Marryat and G.A. Henty and Edgar Wallace and a variety of historical novelists whose names elude me now. What was needed was a way of encouraging the others to poke their noses into the available pages. It was pretty obvious what the problem was. The books were arranged in some arcane sort of system that involved three digits and subdivisions, and there was an absolute absence of signs. This was easily remedied. The books should be arranged by degrees of interest, by levels of appeal. Never having heard of Mr. Dewey or his Decimals, I spent some serious time emptying all the shelves of the books, and arranging them on tables under a variety of more alluring headings. EXCITING BOOKS ABOUT THE SEA. BOOKS ABOUT BATTLES. KINGS AND QUEENS. That sort of thing, which merged the fiction and non-fiction into potentially pleasing sub-sections. Enter a violently angry deputy head. I can remember the volume (max) of his shouting, and the instruction - to get all the books back on the shelves exactly where I had found them. That was more than a tall order. It would have been easier to knit a parachute out back-numbers of The Children's Newspaper . I suspect that he recited his riot act to his father-in-law, who was more temperate about my peculiarities. In fact, I owe him a great debt. As a keen cricketer, he might have been expected to frown upon indolent eleven-year-olds who were bored in the outfield, and unable to bowl over-arm. On hot days, he excused me from games, and gave me his study, clearing a space on his leather-covered desk so that I could write plays. I wrote four and got into a fifth. The first play tells you all you need to know about the world I inhabited. It was a small one. I mean, I knew there were other people in the world, poor people. They went to places called grammar schools. We were lectured upon privilege weekly by the music teacher, a Mr. Christelow, who traded silence during Beethoven for three minutes of Doug Sheldon singing “I Saw Linda Yesterday”. A socialist, he had infiltrated an otherwise Conservative establishment. I took up his challenge, and came out as a Liberal for the 1964 election. I wrote a manifesto, and cut out pictures of Jo Grimond to go with it. It was homework for English, and elaborately ticked. The only critique was in a note at the end: “I hardly think the issue of Free Trade is as important now as it once was.” My Liberalism, like my attempts to play A Walk In The Black Forest on the piano (it was my way of exonerating myself for failing to achieve even Grade 1), was the subject of great mirth in the staffroom. However, when the 1964 election - for which all lessons stopped - spilled into Friday, and the potential Labour victory started to hang on the handful of far-flung Liberal seats, the joke lost its zest. My forlorn cheer when a Bonham-Carter came a poor second was greeted with a forest of frosted looks. The first play (handsomely written up as part of VOL 1. in a buff exercise book) was called “Glory Of A Private Detective”, about as snappy a title as you'll find in The West End at any given time. To say that it owes a little to the oeuvre of Agatha Christie would be to play down her part too extravagantly. On the other hand, she rarely ran to 27 characters in a whodunnit (in my defence, I had better tell you that the other three and a half plays are a dystopian English nightmare set in the future (1969); its prequel; and some footling historical material set in Wessex in the reign of Egbert. I had range, at least). E.S. (from upstairs): Already? Good Lord, father, detain her, detain her quick. G.S. moves R.L. to the door, opens it, goes out. Sound of outside door opening. be (V.H. followed by E.S, enters L.R) down in two ticks. (Motions to sofa) Sit down, make yourself at home. G.S. : Can I get you a drink? drink) Oh! thank you. (V.H. sips her drink) I hope I'm not early. G.S. : Good Heavens! No...in fact, I'll see where Edward has got to. Written when I was 12, in January 1965, this jolly opening is a sort of strange amalgam of Any Old Christie Play and Sunday morning at my grandparents' house, where it is certainly mentally set. Veronica is drinking the lethal combination of gin and vermouth that my grandmother drank, indeed almost every woman drank whom I saw drinking. Everyone is on their complete best behaviour. Ladies first. Please and Thank You. Apologies all round. Make yourself at home. Mild expletives only. The Times. Capacious sofas. And everything “looking expensive”. I am sorry to have to tell you that Veronica cops it at the end of the first scene, the first of four victims, when she is run down by a very terrifying sound effect of a lorry, driven by the token, aitchless proletarian, one Ernie Pullman. Unfortunately, I never secured financial backing.